Straight forward case of this disease type, which before now and still somewhat today is described as “rheumatoid callous muscle”. 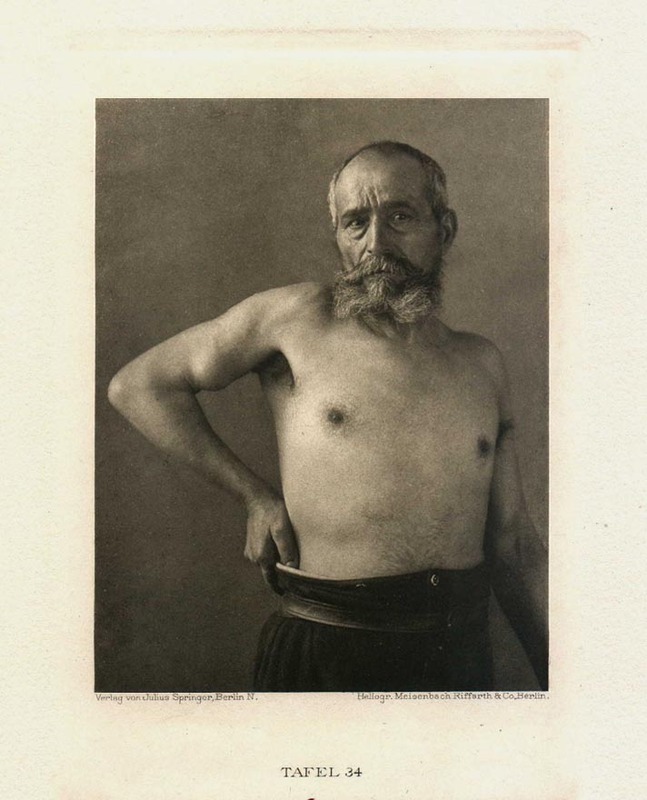 The 64 year old, previously healthy and particulary muscular patient suffered for many years from “rheumatic” pains, which in the last 13 years asserted itself particularly in the arms, so that he was compelled to relinquish his occupation as a smithy and become a tradesman. Regarding the cause of his disease he knew nothing more, except the 23rd year of his life brought a whelming feverish illness, which consequently dragged on for nearly 3/4 of a year, this a connection not in the least. The principle variations in the muscle system regarding both the upper arms, in which once again the right more than left is changed, is diagrammed in varying poses within 3 sequential plates. The first image in plate 33 models the patient with pendant arm. 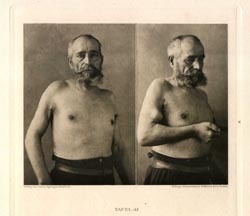 The upper arm contrasting with the fully normal lower arm appears substantially emaciated. One observes the region of m. deltoid, and that of the triceps. But by far the m. biceps is the most stricken. In an area of their upper half is found a deep furrow. Also the lower structure appears vapid and weak. Palpation yields that the upper muscle half is metamorphosed into a thinner, rough, sinewy cord*. Of similar quality is the lower terminus of the muscles, while only the middle structure offers a short stretch of moderately normal muscle consistency. With a sharper flection of the arm emerges quite distinctly the narrow volume of the non fibrose degenerated section, which juts as a chicken egg size bulge between both fibrose ends. Quite clear in plate 34 are the long upper and the callous lower muscle strands, demarcated with only a slight contraction of the biceps. The altered muscles are painful neither in rest nor with movement or palpation. Electrical behavior without anomaly in these contractile structures. The microscopic test of an extracted piece of muscle from one of the contractile portions of the biceps had a remarkable result: concentrated prevalence of well nourished trichinas in a calcified capsule. Surrounding the trichinas, vast chronic enflamed alterations and still wider stretches of malignant growth beyond in the interstitial connective tissue. This discovery lays a correlation between chronically calloused Myositis and proximal trichinose muscle. The concurrence of this infectious disease with “chronic rheumatoid” affection of muscle has been previously remarked (Wendt). In spite of great pains taken with the anamnesis of the patient, time of infection could not be determined. It is still possible the invasion is connected with the feverish sickeness already mentioned. * Nowhere is bony transmutation established. ** Full particulars will be soon disclosed elsewhere.